I saw this on Pinterest. It’s called a Buddy Box. I thought these were genius. 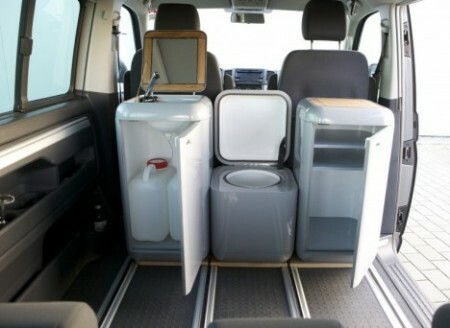 There is a box for water, one for a porta-potty and one that turns into a table. Unfortunately, the prices are absurdly expensive. In order to get the setup like you see in that photo (including the mounting plates for the C-rail), you would need to spend 1994 Euros or $2195. When I can get a pretty good tent trailer for only $700, it seems insane to spend THREE times that much for just three little units. Of course, you could build little boxes just like this to fit into your vehicle. The Cook Buddy is very similar to the plans for the Work Top Box from Blue Sky Kitchens. In the end, those Buddy Boxes are cute and look kind of cool, but with a little plywood, you could recreate them and it would only cost you a tenth of what they cost.